This might be the paper (or perhaps the first of many papers) that I’ve been waiting for. Like many colleagues in the #FOAMed world I’m a big fan of point of care ultrasound (POCUS) in the ED and I increasingly find it incredibly helpful in patients with respiratory associated symptoms. Over the years I have often found patients with respiratory symptoms challenging to diagnose and I don’t think I’m alone. For a number of years I used to ask a fairly standard question in interviews that went something like this…..
It’s hardly a Google question, but it was designed to explore how candidates handled uncertainty which I believe to be a key skill in medicine (and especially so in EM/Crit Care). There are no correct answers*, it’s a question designed to get candidates to talk about their own experiences, and amazingly I would estimate that about 90% of answers involved a ‘breathless patient’. I must also admit to my own frailties and the evidence surrounding the imperfections of the chest X-ray in diagnosing significant pathology. For our sickest patients who often get portable oblique-o-darko-grainy grams in resus the X-ray is even more challenging (no criticism of our fab radiographers, they will freely admit that portables are not as good as departmental films). Even then we know that the standard chest X-ray misses conditions like pneumothorax and is often unable to identify conditions such as pulmonary embolus. In summary. Our current experience and the current tools available to us at the bed side are imperfect. This month the Lancet Respiratory Medicine journal publishes a randomised controlled trial on exactly this question. Can POCUS help emergency physicians get the answer, faster, safely and more accurately if ultrasound is incorporated into the initial assessment. As always I strongly advise you read the paper (which was surprising tricky to find as it is only available as an e-pub until it goes into print at some point in the future. so my thanks to @criticalcarereviews @cliffreid and Dr Laursen for helping me find it legally! ). Interesting, this is a randomised controlled trial of a diagnostic tool. I like this as we have argued before at St.Emlyn’s that diagnostic tools should be evaluated carefully and in many cases that means that we should be evaluating the impact of diagnostic tests on patients. Now this study does not go as far as that, we do not have much information on patient outcome (just crude mortality), but we can use this design to find out whether clinicians achieved a different diagnosis on real patients in real time. A typical diagnostic cohort study cannot do this. As an emergency physician I am most interested in whether the patients in this study are the same as those that I would like to use it on in my practice. Looking at the inclusion and exclusion criteria it’s similar but not quite the same. Streaming seems to take place in Denmark before patients are admitted to the medical emergency department with cardiac and suspected (presume low risk) PE patients being treated as out patients. This is significant as some of the diagnostically challenging patients are apparently initially cardiac, but turn out to be respiratory and vice versa. My group of patients in Virchester are less well differentiated as I might expect a broader cohort of patients.. The inclusion criteria (in the abstract above) are reasonable and seem to identify a group of reasonably unwell patients, so in respect of severity they are similar if not the same to the patients I want to use USS on in Virchester. As an aside I really like the idea that the patient opened their own randomisation envelope in this study. I really like this a lot and I think we should see more of it. However, the enrollment was not consecutive, only taking place when the author was present. This can influence and bias a study as many of us believe that we see different types of breathless patients at different times of day, week and month (early morning cardiac failure anyone?). Eligible patients were scanned within one hour of arrival. Scans of the lungs, heart and deep veins were performed by an emergency physician – but – it was always the same physician who did this. This clearly limits the generalisability of the findings as a wider range of physicians with perhaps less expertise and enthusiasm might result in rather different levels of accuracy. The study is pretty small as we can see from the wide confidence intervals in the results and has been conducted as part of the lead authors PhD. What about the gold standard? Clearly in any diagnostic study we want to know what the patient actually had as that is what we want to compare it against. In this study the authors used a 4-hour determination of the patient’s likely diagnosis and then used a discharge diagnosis to determine a true gold standard. Such a gold standard is often used in clinical trials and although it has it’s problems from a practical perspective it is achievable and reasonable though subjective. The final diagnoses were agreed by two clinicians who were did not perform the ultrasound examinations. The headline figures here are that by 4 hours 88% of the patients in the USS group had a diagnosis that proved to be correct, whereas 63% of the non-USS group had the correct diagnosis. This may be because of the USS< but also perhaps as a result of more testing following USS. Perhaps as a result of USS findings, though this is unclear. The absolute risk difference then is 25% leading to a NND (number needed to diagnose) of 4. That’s a remarkably small number! I’m always a bit sceptical about such small NNTs and there are reasons described above as to why it may be so low, but it is certainly enough to raise interest. In terms of patient outcome (which is what we are truly interested in) then there is no statistical difference between the two groups, though interestingly more patients died in the USS group as compared to the control group. However, the numbers are so small that we should not infer anything from this apart from the fact that we need a bigger trial. What does this mean for us in the ED? This is further evidence that POCUS of the chest may be of benefit in the ED. However, although this is an RCT there are some significant biases within it. Whilst I personally agree with the results and in all honesty I wish them to be true, there is not evidence here to firmly change practice. For me I would like to see more studies using a broader population base, multiple USS operators and larger numbers…., although when that is done I suspect it will show something similar (but not quite as dramatic). I wanted this paper to be the game changer that I had hoped for, but it’s not that yet. However, there is enough here to make us stop and think about the technologies we currently use and to think hard about whether USS will be the answer. As with many studies we have managed to answer some questions, only to find ourselves with many more to ask. There is always #FOAMed to help. 2. The ultrasound podcast Part 1, You’re patients deserve this. You should also check out an alternative review of the paper (which comes to very similar conclusions) over at EMLitofNote written by Rory Spiegel. 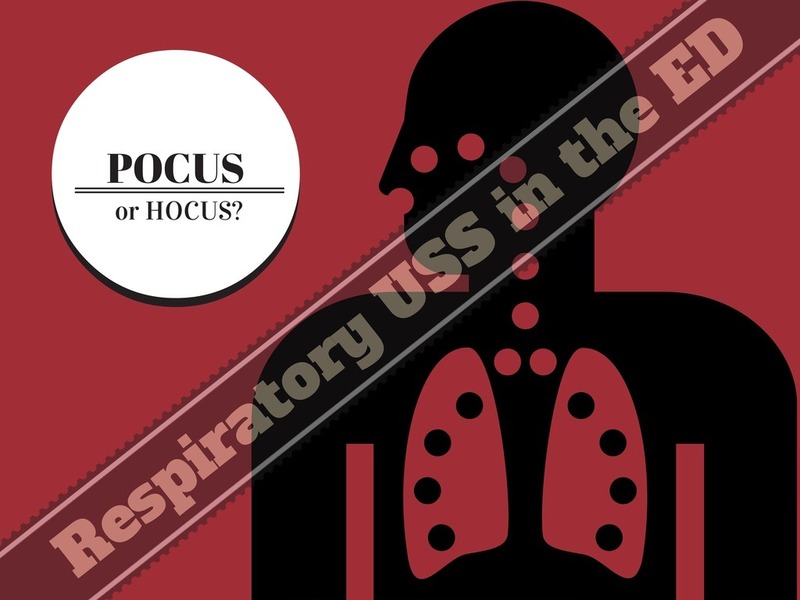 In the meantime may I suggest that you get some training on chest USS in the ED as you might need it sooner rather than later. * There are no correct answers to the interview question, but there is an incorrect one. Any candidate who stated that they were never uncertain and that they were always right in their assessments would be thanked for coming but no job offer would be forthcoming. Simon, you asked for my opinion on this paper via twitter, so below is the email copy and pasted that I sent to others about this. Clearly not as smart as you and able to dissect this paper thoroughly enough, so the below are just some ramblings about what it could mean for the future of ultrasound education. Really interesting paper. Especially interesting that although the abstract shows this amazing increased diagnostic accuracy, there is the trend when you read the paper of increased downstream testing (way more echo, thoras, etc) and even a trend towards worsening mortality in US group. Trends of course, but people are talking about this as they should be. Could the increased ability to find disease mean more testing and more harm? 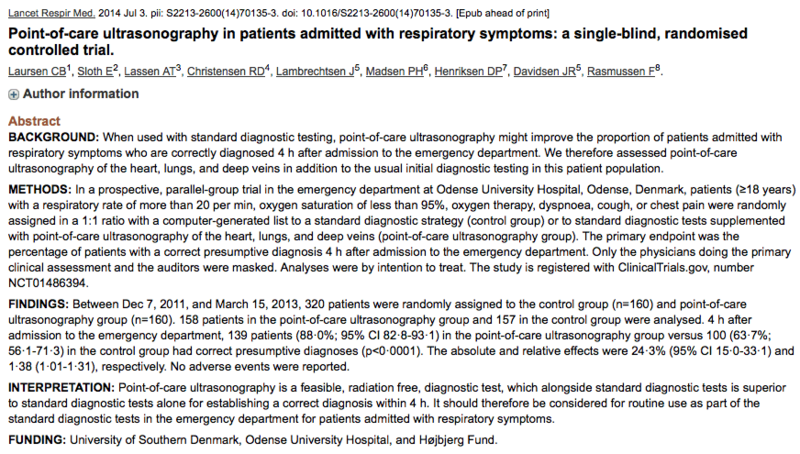 It seems that we’ve moved beyond the simple questions of “can you US lung” and “can non-radiologists use this”. Looks like that’s been accepted pretty well. Probably time to move on to the much tougher task of teaching people how to use this powerful device to better take care of patients, and not just be a diagnostic machine. Probably need to focus more on things like “do you really have to treat every pneumonia if it’s that much more sensitive than X-ray”, and do you really need to tap that effusion if you wouldn’t have even seen it or known about it without ultrasound, and do you really need to operate on the small ligament tear that wouldn’t have been diagnosed without ultrasound. Maybe those negative trends were just flukes……but maybe not. Maybe our ability to diagnose with ultrasound has outstripped our collective ability to know what to do with all these new diagnosis. Hi Matt, so glad you were able to drop by and comment. Many thanks for that. I must admit that I had not considered your analysis – maybe USS is picking up subclinical (not quite the right word) issues that then lead to more investigation and therapy. I think that’s a really interesting question and I remember similar thoughts being given when we first started with trauma FAST. I feel as though USS is an advancement and adjunct in breathless patients and although this paper does not show what I thought it might it is good enough to get us thinking, talking and sharing. Love the http://www.ultrasoundpodcast.com/ of course and regularly point colleagues to it. Really nice review and comments about this article. I’m going to try to put some thoughts down here without sounding like a moron compared to you and “The” Dr Dawson. Although I don’t think this is a practice changing article, due to it’s lack of generalizability, I think that is a landmark article for bedside ultrasound and will be a topic of much discussion for some time. I also found the increased testing in the ultrasound group interesting, but actually expect it at this stage of the game. We (and more importantly our colleagues) are still figuring out just how good we are at ultrasound. Can we trust ourselves? Can others trust us if we call them on the phone and tell them about the 53 y/o female that has a PE because she is short of breath, hypoxic, and has sub-pleural consolidations consistent with a PE. I know I get a different response than most of my EM colleagues when I call our surgery service and tell them I diagnosed an appy using bedside ultrasound. Many of these additional tests are often to convince ourselves and our specialty consultants that we are correctly diagnosing diseases. The article recognizes this and I think puts it very bluntly, that an improvement in diagnosis should be worth a loss of cost efficiency. I would agree with them, but I would also suggest that with time, not only will more of us be well trained in ultrasound, but we will gain more confidence with ultrasound made diagnoses and thus order less additional testing. Trying to make cost efficiency arguments with such a new, rapidly progressing technology as bedside ultrasound is difficult, especially when we are talking about making diagnoses that are less emergent and comparing it to well accepted modalities like CT. The remainder, I agree with Matt, are likely due to over diagnosis due to the increased sensitivity ultrasound has, specifically for lung pathology. Testing leads to more testing, until we decide there are some things we don’t want to know, ultrasound is not immune to that, but if we use it the right way it might be a solution to help us determine who needs the testing and who doesn’t. Thanks for your review of the article.